What can Bengaluru expect from BBMP’s 14.4-crore plan to send pourakarmikas to Singapore? Even as Bengaluru’s waste generation has grown by 1,750% in 15 years, collection and management of the same have not kept pace. Meanwhile, the Bruhat Bengaluru Mahanagara Palike (BBMP) is planning a repeat of last year’s trip to Singapore for many of its pourakarmikas in a few months, says Hari Shilpa, Assistant Commissioner of Administration, BBMP. They have issued notices to zonal level officers to send lists of potential candidates for the trip. Like last year, the four-day programme would probably include comprehensive sessions on safety gadgets and equipment, environment, beautification, the 50-year history of Singapore, water conservation, reuse and processing, collection through chutes and primary and secondary collection in parks. The pourakarmikas are interviewed before they leave as well as after they return, and their learning and feedback are recorded. With a target of sending about 1,800 workers, the government estimates an expense of Rs 14.40 crore on this. In the last eight months of 2017, 502 pourakarmikas were sent from various urban local bodies to Singapore on a four-day trips. For every pourakarmika, the spending was Rs 80,000. In 2017, almost 10 to 15 batches were sent by the Directorate of Municipal Administration (DMA) as well as the BBMP. About 80 out of the 18,000 pourakarmikas in BBMP limits were selected. This year too, BBMP would apply for their passports, according to Hari Shilpa. Santhosh Kumar Kaddi, Environment Engineer, who accompanied one of the batches, explained that the first set of batches from Bengaluru Metropolitan Area (BMA) left in July 2017, while the second set of about 15 BBMP batches travelled from October 23rd to 27th. “Ours was the sixth batch,” he explained. 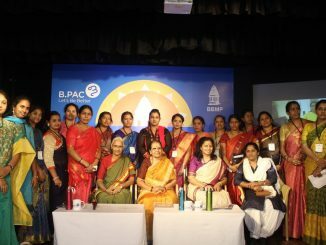 Each batch was comprised of 42 members. Three officers accompanied 39 pourakarmikas. It’s interesting to note that the number 42 was arrived at to accommodate every group in the Singapore bus, which had the exact carrying capacity. One week before they left, the pourakarmikas also got training sessions on “etiquette and foreign culture”. On what basis were the workers selected? Interestingly, there were some well-known names who suddenly aspired to be known as pourakarmikas! Sheetal Singh is the coordinator of the City Managers’ Association, Karnataka (CMAK) — an association of members from all categories of urban local bodies and development agencies and state level statutory bodies across Karnataka, which seeks to provide a platform for urban professionals to interact and bring forth best practices. Sheetal says she was taken aback when she actually got some calls from politicians and local leaders, who asked if their recommendees could be sent on this trip! “We don’t encourage such requests,” Sheetal says. “When anyone calls, I just ask them for their employee IDs and the Commissioner’s recommendation. We cross-check to see if they are actually appointed and working. But the selection criteria were strict, according to Sheetal Singh. The candidate had to be a “medically fit” permanent employee between 30 to 55 years, who had worked for five years at least. Those who were above 55 were not eligible to get medical insurance, so they were not selected, as their medical costs would have worked out to be too expensive. Qualities such as “punctuality, dedication and willingness to learn,” along with awards and letters of appreciation, recommendations and approval were other requirements. But, what exactly was the point of last year’s Rs 2-crore Singapore trip anyway? The objective was to give the garbage collectors lessons on civic issues and cleanliness. 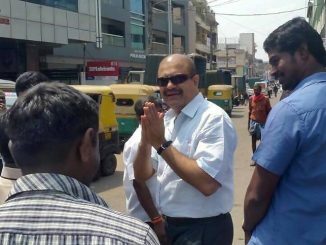 The then Social Welfare Minister, H. Anjaneya, said that the workers would study civic cleanliness and the state-of-the-art manhole cleaning systems, as there have been frequent related deaths and accidents in the city. However, isn’t manhole cleaning under the purview of the BWSSB, rather than BBMP? H. Anjaneya says that he planned to study and implement measures for improvement in tandem with the BWSSB. But it is still not clear how the trip may be expected to solve the problem, unless the technology is adopted and the partnership with the BWSSB is put in place. It certainly has not reduced related accidents, as was observed in January 2018 when the city received the shocking news of the deaths of three manhole cleaners. Admitting that there was no effort to transfer the technology itself to the city, Environmental Engineer Srinidhi said that it was nevertheless good exposure for so many, who do not normally get a chance to go abroad or look at model states. In fact, composting, garbage segregation and management of waste here has improved after the exposure to good models of governance. He added that the city is trying to adapt foreign techniques to the existing situations. Srinidhi also feels that the pourakarmikas learnt that it is possible to spread the message of cleanliness among the people. They came to learn about new ideas and expressed them. There is really no clear survey to show any link between the trip and service improvement. The team did visit and learn about a number of places, but the results seem to have been felt in terms of personality development and exposure to international best practices, rather than real, tangible improvement on the ground locally. Environmental Engineer Santhosh Kumar pointed out that pourakarmikas got interested in the usage of equipment, especially in mechanical sweeping. But then, where are the mechanical sweepers in Bengaluru? Well, they don’t exist! Do the pourakarmikas feel that they benefitted from the trip to Singapore? That doesn’t seem to have translated into much action here. So what is the point? “Well, it was great fun,” said Murthy, who went last July. Nostalgically, he recalled his three-day trip, when he was booked at a good hotel, given good food and taken out on long trips. What exactly did he learn? “A lot,” he says. “We were taught how clean that city is, how carefully the workers execute their tasks and how well the management helps to delegate and fix the tasks of the workers. We saw the effective usage of lorries and machines that were used to help in cleaning up the city. We felt that the system there is very good.” He added that they have learnt new ways of cleaning and are meticulous about wearing gloves now. Murthy has gone back to his routine of collecting garbage in his pick-up autos till 2 p.m. seven days a week, without a single holiday. He says that the BBMP does give them safety equipment, but they do not last beyond five days. Workers’ safety does not appear to be a priority issue in India. All of that is laudable, but the question remains whether we can expect to be technologically savvy enough to be able to execute a Singaporean approach in namma ooru. In the absence of that, this is the best that can be achieved. It is sheer waste of tax payers money. City’s garbage woos cannot be solved by a study trip of pourakarmikas to Singapore. Instead, they would have benefitted, if atleast 1/4th of the trip cost was given to them in cash. In Bangalore, what is needed is change of people’s mindset. For this, one to one interaction with residents is needed. The area BBMP, governs is pretty large and it is understandable that they don’t have adequate manpower or resources to undertake this exercise. If so, it would be easy for them to invite NGOs, University students and Volunteers, for a door to door.At the same time, a more dedicated service from BBMP also is needed. Otherwise, we will go on complaining and discussing it for many more years without a solution. What is the use of spending so much money on travel for pourakarmikas, when nothing is being implemented? Isn’t it a leisure trip for the government employees? The only change I could see in the past is people are wearing gloves, for which no pourakarmikas had to go to Singapore. It’s common sense. Why don’t the government use the money to build a garbage decomposing factory? 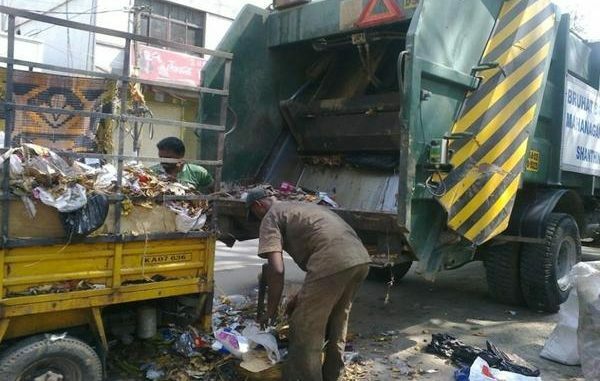 Why there is no rule of collecting wet and dry garbage separately in many places in Bengaluru itself? Government has to implement small rules to make the city clean. A sheer waste of public money. As somebody else suggested get trainers from Singapore or any other European country , train extensively a batch of local people who in turn can train the entire lot at a fraction of the cost. First the city planners and municipal corporation executives should go to Singapore to learn planning & coordination ! On one side BBMP cries about lack of funds for anything and then they come up with outrageous spending plans like this. Truly a sad and inappropriate way to spend 14.4 crores… Instead should spend that amount on regularly picking up all the garbage sitting all around the city and keeping the city clean. A thorough check of the individuals who are going to singapore should be done along with a highly punctual hardworking supervisor to ensure that all the poyrakarmikas are effectively trained. Better to have a consultant at Singapore to train them and provide a report from his end too. All their names should be in public so that any unwanted character is present he should be severely penalized along with the person who is responsible for sending. isnt it better/cheaper to have a training programme in bangalore and ask singapore govt to nominate trainers? It is mockery of pathetic conditions of poyrakarmikas who are left on roads with a broom and gunny bag to tackle city’s unmanagement waste and dust on streets without any safety gear. This much money could have been spend in providing them training, safety gears, proper equipments and on swept waste collection. What would they see there how inhumanly they are treated.